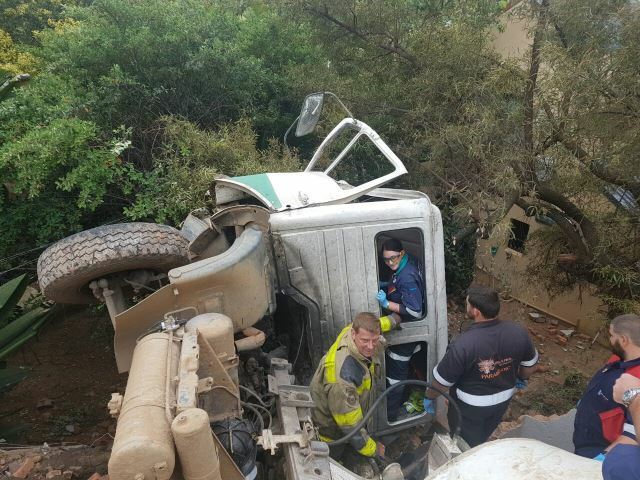 A truck driver has sustained moderate injuries after a truck delivering cement rolled back on a steep road and crashed through a residential wall on Korannaberg street in Waterkloof Heights, Pretoria. When Netcare911 paramedics and other services arrived on scene they found the truck driver still in his truck with moderate injuries. They also found the truck lying on its side. The man was stabilised on scene and thereafter transported to a nearby hospital for further medical care by paramedics from another emergency service. Paramedics worked alongside the Tshwane Fire Department on the scene.